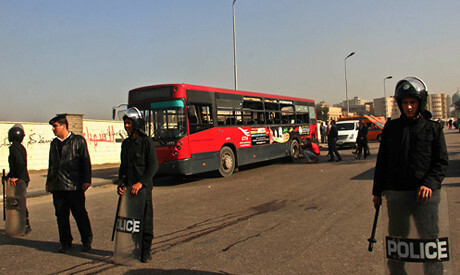 Egyptian bus bombing in Cairo on December 26, 2013. The incident was cited in an ongoing crackdown by the military-backed regime., a photo by Pan-African News Wire File Photos on Flickr. A bomb that hit a bus in Cairo's Nasr City on Thursday was designed to target the security forces, the director of the interior ministry's explosives department has said. "A bus exploded after passing the bomb resulting in the injury of five people. Two other bombs were designed to explode near the site when explosives experts and security forces arrived, but they were diffused," Mohamed Gamal told Al-Arabiya TV channel late on Thursday. He urged citizens to report any suspicious objects to the authorities. The explosion on Thursday took place on Mostafa Nahas Street in Nasr City, an affluent suburb of eastern Cairo. The street is close to an Al-Azhar University building, the headquarters of the National Security apparatus, and a police station.